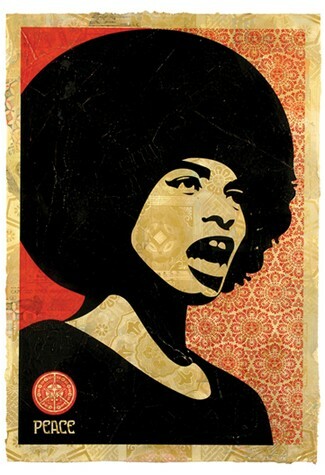 I’ve probably noted before that if I ever have any extra money to spend, I’m going to buy this Shepard Fairey poster of Angela Davis — in part because I find it to be the pinnacle of Fairey’s art, and in part because I’ve been moved by Davis’s open mouth and articulation of the importance of protest since I was in college. It gives me pride to see this print, and I could use it as a visual reminder of the power of words to stop the wheels of the machine. The poster’s on my mind again after seeing the Swedish documentary, The Black Power Mixtape, 1967-1975. It’s a film that has left me surprisingly unsettled, and not just because it’s a “mixtape” with no conclusion, no moral. A compilation of original documentary footage made by a Swedish crew and intended for Swedish television, it doesn’t just show the public images of proud and defiant African Americans that we’ve all seen in those documentaries. It also features amazing, intimate interviews with some of those individuals. Most moving of all is when Stokely Carmichael (before he renamed himself Kwame Ture) takes the Swedes’ microphone and turns to gently interview his own mother. They talk about their family’s struggle with poverty, their family’s many memories of discrimination. You also get a sense of the generational divide between them. It’s almost impossible to capture how meaningful such a moment is — until, that is, you see an interview with Angela Davis during her prison term in which she forcefully schools the clueless interviewer about why black power has not eschewed violence as a tactic. I’m not saying it’s perfect. It’s interspersed with some clunky modern-day blah-blah-blahing by academics and others. But it’ll stick in your mind, and it’ll make you thirst for clear-throated articulations of social problems.